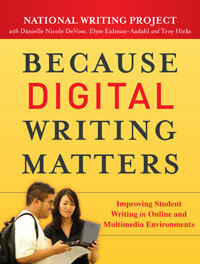 Why does digital writing matter and what should educators do about it? That’s the question at the center of a new book by the National Writing Project, Because Digital Writing Matters, which examines what teachers, administrators, policymakers, and parents can do to equip schools to meet the challenges of teaching the digital writing communication skills students need to thrive in our high-tech, participatory culture. In the following interview, the three authors of the book—Elyse Eidman-Aadahl, director of NWP’s National Programs and Site Development; Danielle DeVoss, an associate professor of the Professional Writing Program at Michigan State; and Troy Hicks, director of the Chippewa River Writing Project at Central Michigan University—share their thoughts on how the ever-changing digital landscape affects the teaching of writing. Why does digital writing matter? Elyse Eidman-Aadahl: The short answer is that we live in a digital, networked world, and there’s no going back. Quite simply, digital is. Our handheld devices, our cell phones, the media-rich environments that we all spend so much time in are spawning new literacies at what sometimes seems like the speed of light. Consider that today’s 21-year-olds have played 10,000 hours of video games and sent or received 250,000 emails or instant messages. Then consider that the work environments and the community environments they will graduate into are also deeply digital, wired, and interactive. It’s imperative that our school environments reflect the networked nature of the digital worlds that students live in daily. Danielle DeVoss: It’s interesting because in some ways students are now writing more than ever—blogging, text messaging, emailing—but they don’t often call it “writing.” Writing is something they do in school while what they do outside of school in a more participatory way is something else. That fact alone tells me that we need to rethink the “how” of teaching writing to bridge that gap and equip students to thoughtfully create and judiciously consume Web content. Troy Hicks: Yes, it’s not enough for students to write online—they need to really use the Web in ways that take full advantage of its strengths. The collaborative, participatory nature of the tools calls for us to integrate newer technologies such as blogs, wikis, social networks, podcasts, and digital stories in our teaching. We, as teachers of writing, need to consider how these literacies interact with—and sometimes change—how we teach writing. What is digital writing and how is it different than traditional writing? DeVoss: Digital writing can be simple text production using a computer and word processing software, but nearly all writing today is informed by, if not created with, digital writing tools. The true digital revolution isn’t in computers alone; it’s also in the networked spaces computers provide, where we can compose and create and share and publish to the world. It’s not something we do using the tool, in other words, but a way of being and working together as we use the tools. Eidman-Aadahl: Yes, if you think about it, the nature of digital writing is such that it speeds up and amplifies what we experience as writing. All writers share texts and get feedback. Digital writing can invite feedback in a different way because online tools allow virtually instant sharing of texts with a wide range of audiences throughout the writing process, resulting in a composing process that may be public and interactive from the earliest stages. So a key component of the writing process, such as revision, becomes not so much a “late stage” procedure, but a continuous and collaborative process that students and teachers participate in their own digital communities. Hicks: I think it’s also important to consider how the core principles of writing are still the same. Digital writers, like traditional writers, choose particular elements that make their writing come alive. Digital composition, like text writing, requires crafting effective leads, adding appropriate details, moving a piece along with effective transitions, and bringing a piece together with a strong conclusion. In that sense, we are still teaching writers, even though the technologies keep changing. Still, digital writing forces us to rethink writing because it involves remixing media, mashing up existing cultural works to make a different story, using images and sounds—all in an interactive way. Does teaching digital writing require a fundamental change in the way writing is taught? Hicks: In some ways, no. We still have to engage students in a writing process that focuses first on the writer, then on the writing—and lastly on the technology. But, in some ways it matters a great deal. We need to ask ourselves, “What does it mean to be a writer in a digital age?” For example, when and how do we use images, sounds, and music to support our arguments, descriptions, and stories? When, and why, do we post to a blog as compared to a wiki? Digital writing still requires that writers move through recursive phases of planning, reflecting, drafting, and revising, but we can’t simply bring a traditional mind-set to literacy practices if we’re going to make the substantive changes to our teaching that need to happen to embrace the full potential of collaboration and design that digital writing offers. DeVoss: I agree. Teaching digital writing isn’t a matter of putting old wine in new bottles. Writing isn’t a container, so the technological changes in production and distribution matter a great deal. Both writing and technology are complex, socially situated, and political tools through which humans act and make meaning, so teaching writing naturally shifts with digital writing because of the affordances of the tools. When students work together on a wiki, for example, they’re writing in a very different way than students did in the past because they are really experiencing collaboration and how knowledge is made and distributed in digital spaces. Their audience shifts from what might have been an imaginary concept to something very real. As a result, we have the responsibility to teach students how to swim in the sea of information and media that is the Internet—both as creators and consumers. If writing is becoming more collaborative and group-based, and increasingly using new forms like video and audio, how does this fit into current standards and assessment? Eidman-Aadahl: It’s a vital question, especially since the proliferation of new digital tools is happening at the same time there are national and state movements to emphasize standards and assessment as the centerpiece for educational reform. We really need to explore the “what” and the “how” of digital writing to define the rhetoric of different digital environments and to inform new standards and approaches to assessment. For example, some see digital writing as part of a larger set of technology standards and most current writing content standards focus exclusively on written text. Ideally, standards for technology and for digital writing would be intertwined: a double helix of writing and technology. Hicks: On one hand, digital writing can be assessed in a similar manner to all writing. Does the piece achieve its intended purpose? Does it resonate with an audience? Does it meet various accepted standards of performance for products of its type? On the other hand, assessment needs to take into account those qualities of writing that are unique to the digital world, such as the particular aspects of the media being employed in the text, the wider and immediate audience that online writing often reaches, and how the writer analyzes and responds to audience feedback. Likewise, as Elyse said, the “what” and the “how” of digital writing need to factor into assessment because digital writing puts a different emphasis on collaboration, brainstorming, and revising. It also changes the expectations of form since Web-based writing is often shorter than other texts and it leverages visual design. It seems like it could be challenging to ask teachers to integrate computers into their lesson plans, especially those who aren’t techies. DeVoss: Training and professional development are key. For computers to be richly connected to curriculum, a great deal of time and training must be allocated to their integration. It’s not just about training in how to use the equipment, though, but about providing professional development around shifting notions of texts. For example, where does grammar instruction fit in a slideshow presentation? Also, especially since technology is evolving so fast, teachers need to be able to teach across an array of student technological skills—and with privacy and personal safety issues in mind. Successful integration can’t happen with a one-shot training session. Improving the teaching of digital writing really requires a sustained schoolwide effort. So teachers’ professional development is obviously going to be key. You can’t just equip a classroom with computers and expect a teacher to use them effectively? Eidman-Aadahl: In the National Writing Project, we have seen that teachers will absolutely embrace and enjoy technology, but professional development has to address all the elements that support digital writing for change in classroom practice to happen. Because of the ways in which technologies emerge, evolve, and disappear, professional development to improve digital writing needs to go beyond a focus on technological skill development alone to include teacher leadership. When technology changes or disappears, specific skills change, but the investment in leadership lasts. We think the richest conceptions of professional development should be informed by three principles: 1) People transcend tools; people should be primary; 2) Good pedagogical practices transcend technologies; practice should be central; and 3) Designs for learning transcend designs for delivery; professional development should be learning-focused. It’s important, for instance, for teachers to slow down, play, and experiment with technology to truly experience it as a writer and a participant in a digital environment. DeVoss: Exactly. Professional development that examines classroom practice, considers standards and assessment, and investigates things like the components of a healthy digital ecology—especially in the context of a supportive community of teachers—can lead to changes to foster teaching digital writing. Hicks: We want teachers to play and take risks. One great part of digital writing is the undo button! We know we can’t “break” things and we should be creative in our work. If teachers are given opportunities to explore technology and inquire into its potential for enhancing learning, then real change in classroom practice can happen.